The subject of emotional fidelity has been on my mind a lot lately since I began working on Rad Dragon’s latest game. As my team works on our game’s story, we wrestle with the fidelity of the tools we have at our disposal to convey emotion. You see, Rad Dragon sits in a strange place in the industry. We’re far from Triple-A in our size and resources, so we’re not working on the level of a larger team making a big console title, but we’re not what I’d call Single-A either: we’re not making mobile games (anymore) and neither my design/writing partner Mike Sennott nor I are very minimalist in our tastes. We love playing elegant games like Super Hexagon and Osmos that use as little as needed to frame a core mechanic or idea, but we also like stuff. We like all sorts of stuff in our games – secret areas to discover, extra little mechanics we’ll use once and throw away. We also like telling stories – stories with actual words – so it inflates our scope a bit and puts us squarely in the realm of Double-A game development. It’s not just me playing Flint, Flint is playing himself, too. I’m not Flint. He’s not Flint. We are Flint and we’re playing this character together. It can be frustrating to make Double-A games on a small budget. Some storytelling tools aren’t readily available to us – things like motion capture or facial animation to convey character emotions – and it’s a daunting task to record voice over for all the words in our game like a BioWare does. Working with these constraints is what I signed up for when starting Rad Dragon, and constraints are really a creator’s best friend. I take particular interest in a game experience that conveys powerful emotion with limited toolsets and I’d like to share with you one such example I encountered. I recently started playing Mother 3 for the Game Boy Advance, a loose sequel to the classic SNES RPG Earthbound that was never published outside of Japan. Like Earthbound, the graphics are 2D sprites and the screen resolution is tiny. Pretty low fidelity with the kind of limitations I can relate to, but this game has one of the most hard-hitting emotional moments I’ve ever experienced. After a short intro playing as his son, I begin the game as Flint, a simple, quiet husband and father of two living in ruraltown, somewhere. His wife and sons – or rather, my wife and sons – are away vacationing with her father at his home in the mountains, when the region is attacked by strangers who create dangerous monsters and spread wildfire all over the place. It’s bad. After some killing of low-level monsters, I rescue my two sons and am caring for them by a campfire while we and the rest of our small town wait overnight for news of Hinawa, my wife. I’m just walking around talking to NPCs, when my friend Bronson returns with news. The reveal is so drawn out. Bronson has good news and bad news for me. Seriously? And he’s having trouble getting his words out. 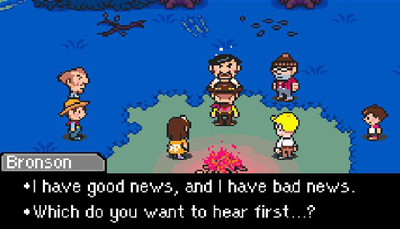 Dialog in Mother 3 is just text, no voice actors, but I can tell how hard this is for Bronson from the “…”s littering his announcement. He never even says Hinawa has been killed. Instead, he paints a picture in my head by telling me that he found a Dragon Fang pierced through her heart. At this point, I’m no longer in control of Flint. We’re in full cutscene mode now, and I’m captivated waiting to see how Flint will respond. I can’t decide how he’ll react, but I know he’s feeling the same way that I, as Flint, am feeling. He has always been a silent protagonist and has always been pretty good about doing what I say. Now Flint is having a meltdown. He’s acting, reacting on his own and, to me, it’s not just me playing Flint, Flint is playing himself, too. I’m not Flint. He’s not Flint. We are Flint and we’re playing this character together. Flint has dropped to a knee at this point, perfectly still and I know what’s happening. I can feel it somehow. Everyone is surrounding us now, staring and trying to console us, but we’re getting more and more furious. We’re frantic and drunk at the same time from the shock. I’m running through the past hour in my mind just like I know Flint is. We stayed behind to get work done while our family went away. If we’d been with Hinawa, maybe this wouldn’t have happened. But it did happen, and we weren’t even there to try and help. I know the fear of this in my real, non-Mother 3 life. I’ve been in situations where my wife has gone away and I stayed behind to work on my games. If something happened to her, I’d be on my knees too, just like I am now, as Flint over Hinawa. We’re going to do something, but I don’t know what, and it’s probably not going to be up to me. All of a sudden, Flint moves. Standing up carefully, we walk over to the campfire and smash it with our palm, pulling up wielding a flaming log. We swing it wildly in blind anger. When a villager approaches gingerly to calm us, we HIT him with the log – and not just a generic swing animation, either. We jab the end of the log violently into the villager’s stomach and he crumples to the ground. That was a little overboard, Flint, but I know we need this release. We don’t want to need it, because our impressionable sons are sitting a few feet away, watching as another villager tries to block their view. Finally, someone knocks us out and, as if reading my mind, Mother 3 shows me a memory that, though I had never seen it before, I had started to formulate in Flint’s head. Flint stands outside his house as Hinawa and the kids get ready to leave for her father’s. As they start to walk away, Flint takes an unsure step towards them, and they turn back. We’re not an effusive character, though, and get tongue-tied while considering how to express our love, so they turn back around and head out. It’s okay, we’ll get another chance to see Hinawa BUT OH GOD, no we won’t. I’d never actually seen Flint in a scene together with Hinawa before and, for a brief moment, my Flint regret surpasses A.I. Flint’s. At least he got to know her. I never will. Remember that this is all happening with 2D sprites and music, sans voice or facial animation. Yet everything I just wrote is exactly what happened in my head during this sequence. The low-fidelity graphical representation of the scene walked a line between the dynamics of a film and a book. Like a film, I could see the characters onscreen and glean a little about their personalities. I could see them animate and interact. Like when reading a book, my imagination projected details beyond what was written in text or displayed in sprites – Bronson’s difficult revelatory speech; the tension in Flint’s closed fist as he knelt in silent pain; his off-balance stagger as he swung the log. I’m not just projecting from nowhere. 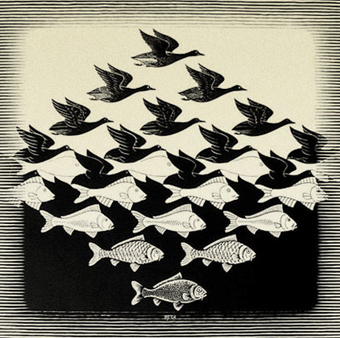 The game led me to these imaginations, an extremely powerful technique. By inspiring me to project detail into the scene, Mother 3 sucked me closer into my character like a vacuum. While trying to figure out what Flint must be thinking, I myself began to think it – Flint and I merged into a symbiotic character. Since I could glean little emotion from his minimal facial detail or basic animations, I performed them for him in my head – the sound of his quickened breathing, his weary posture, the deafening silence of his wordless initial pause. This is the sort of work that I have to do – that I get to do – in the Double-A game I’m creating. Like in a painting, the white space where I choose not to paint is often the most impactful choice I make. It’s a relief for me to have experienced this in a game with a lot of text dialog. Lately it’s common to critique games with abundant text dialog as inelegant, when games like Journey or 30 Flights of Loving accomplish so much with no words at all, but Mike and I stand steadfast behind putting text in our games: the written word is a tool not easily discarded or replaced. Of course, I have no delusion that all storytelling games require words. I confided in Brendon Chung a couple weeks ago how jealous I am of his storytelling skill demonstrated in 30 Flights. The absence of text is irrelevant to my sentiment. Rad Dragon’s games do require text. There are things we want to say, specific details that are important, and I’ve learned that those details can inspire the player to imagine even more. Mother 3 reinforces my faith in this, and teaches me the art of Double-A medium-ism. A storytelling game can have words – lots of them – but still only as many as are needed. Sometimes I’ll need to give a character a few sentences to express a specific feeling. Other times, a Bronson-esque “…” will do the trick. Teddy Diefenbach is probably sitting somewhere coding right now. Follow him on Twitter @TeddyDief to see when he resurfaces.